The best choice for parents on a budget. Lightweight baby bouncer with the toy bar. High-end baby bouncer with exclusive design. Affordable bouncy seat for babies by famous brand. 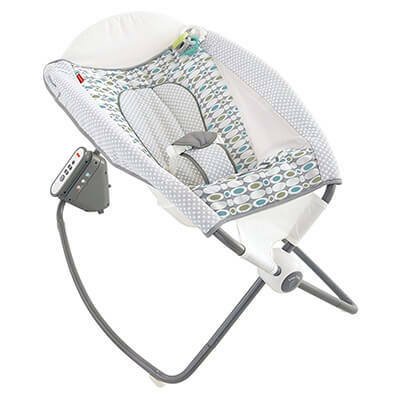 Lightweight bouncer with all the soothing features baby needs. At What Age Can I Start Using a Baby Bouncer? Can Baby Sleep in a Bouncer? How Long Can a Baby Stay in a Bouncer? Can I Take a Baby Bouncer Outside? What’s the Best Type of Baby Bouncer? As much as you love your new baby tremendously, holding your baby for hours each day is tiring. You really need a shower and to eat a meal alone, but your baby just wants to cuddle and snuggle. It’s lovely but exhausting, and that’s when the best baby bouncer comes to help. A baby bouncer is a comfortable, snuggly seat that typically bounces or vibrates, helping your baby calm down and relax when not in your arms. Different companies offer different features, from soothing melodies to colorful toys. You’ll find dozens – literally – of choices on the market, so how are you supposed to pick the baby bouncer seat your baby will love? Don’t worry! We have you covered. We looked at the top picks by parents and narrowed it down to the 5 best baby bouncers, and we know you will love them as much as we do! The Rock ‘n Play has topped the list for baby bouncers for several years in a row, making it onto most baby registry lists. Many parents claim that it’s a lifesaver, and we totally agree! Most infants find the Rock ‘n Play incredibly comfortable and soothing, giving parents much needed time without a child in arms. Let’s look at why this baby bouncer seat scores so well for babies and parents. Motion: Do you need just a few minutes of peace and quiet? The Rock ‘n Play offers relaxing music and vibrations to help your baby unwind and relax. It comes with two rocking speeds, 12 songs, and 3 sound effects! Safety and Durability: Compared to other seats, the Rock ‘n Play has a deep seat, which places your baby at an upright position. Don’t worry; it offers plenty of neck and head support for your child. You can use it from birth upwards until your child is able to sit up. It’s best to stop using it around six months. The deep seat, along with an included three-point harness, prevents your child from falling out of the seat. Parents love the breathable, mesh sides which keep your child comfortable and safe. As far as durability, the metal frame and design ensures you can use this bouncer for years to come. Powered: The Rock ‘n Play runs on either batteries or an AC-outlet. That’s convenient! If you do use batteries, you might notice the rocking will slow down erratically as the batteries drain. Extras for Baby: This area is where this bouncer does lack a bit. It comes with a linkable clacker toy to entertain your child. However, that toy can only be used by babies who are old enough to hold a toy and intentionally enjoy it. Fisher-Price could improve the design if they offered a removable toy bar, but that isn’t part of the design. Washable Seat Cover: The seat cover can be removed and placed into the washing machine for easy storage. However, some of the mesh isn’t easily removed and may need to be spot cleaned. Affordable, but not as cheap as some other picks. Bright Starts sell fun, colorful products for baby, and their Pinwheels Bouncer is no exception. It is a small size baby bouncer, capable of holding a baby up to 25 pounds! The gender-neutral design means you can use it for several babies. Motion: This baby bouncer seat comes with soothing vibrations that will keep your baby calm and comfortable. Safety and Durability: Bright Starts is a trustworthy brand, so that gives us comfort that the bouncer is safe. One nice feature is that the legs are covered in a safe, non-slip rubber. It has a 3-point safety harness, so you don’t have to worry about your baby falling out. That’s always a concern, especially if you have little toddlers running around too! Powered: It only takes batteries if you want to use the vibration features. Luckily, it only requires one C battery, so replacing them continually won’t cost too much compared to other bouncers that need several batteries to work. Extras for Your Child: Bright Starts included a toy bar for your child to enjoy, and it can be removed with one hand. It’s nice to be able to remove the bar, so you don’t smack your baby in the face with the toys. The bouncer is covered with adorable characters your child will love! An included mirror encourages coordination and fine motor skills. Washable Seat Cover: Parents can remove the cover and put it in the washing machine for the quick clean up! If you are looking for a baby bouncer that folds up for storage, the Pinwheels isn’t for you because it won’t fold up. However, it is easy to put together and take apart, so if you NEED to store it, you’ll just have to take it apart completely. 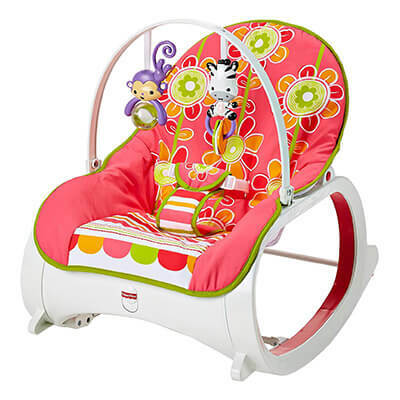 The Pinwheels Bouncer is only 5 pounds, so moving it from room to room is easy. BabyBjorn is a well-known baby brand that sells high-quality, luxury items for your child. Parents have noted that the Bouncer Balance is fantastic for children with reflux because of its four different positions offered. That upright position truly aids babies who suffer. Let’s take a look at what else the BabyBjorn Balance has going for it. Motion: Unlike other baby bouncers, the Balance relies solely on your child’s movement to set the seat into motion. If your baby kicks or bounces around, the seat will move as well. It doesn’t offer any vibration settings. Safety and Durability: All products made by BabyBjorn are top-of-the-line. You never have to worry that the quality is below standards. Rather, the Balance is certified b the Juvenile Products Manufacturers Association. That means experts took this bouncer and made sure it was a safe option for your child. 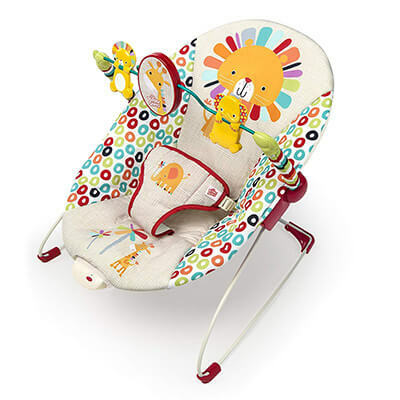 The seat offers neck and head support, which are necessary for infants and newborns to use this baby bouncer seat. Powered: Since the Balance doesn’t offer any music or vibration, no batteries are necessary at all. That’s an advantage for many parents. Extras for Your Child: BabyBjorn didn’t include any toys for your child to enjoy. One nice feature is that you can convert the Balance into a chair, so it can be used from newborn to 2 years old! You’ll get a lot of use out of this seat, which will justify the cost. Washable Seat Cover: Worried up spit up? Don’t be! The cover is removable and machine washable, so you know it will stay clean for years to come. Parents also love that this bouncer folds flat, so you can take it to Grandma’s house or store it when you aren’t using it. BabyBjorn offers eight solid color choices, so you can pick one that blends in with your decor. Lightweight – weighs less than 5 pounds. If you want a bouncer that lasts for years, the Infant-to-Toddler Rocker is the pick for you. It starts off as a modern, infant seat for your newborn with toys overhead and calming vibrations. As your child grows, the rocker becomes a toddler rocker, a place for your child to watch movies and read books. You get years of use from one seat! Motion: The seat offers calming vibrations that will relax your child. As your child gets older, her movements and kicking will cause the bouncer to rock. If you don’t want it to rock, Fisher-Price added a kickstand that makes the seat stationary. Safety and Durability: We know that Fisher-Price always has our baby’s safety in mind. There is a secured, three-point safety harness. The legs have a safety grip to ensure it doesn’t slide around on the floor. Powered: Batteries are required to make the vibrations works, and there are no options for an AC outlet. Extras for Your Child: Above your baby, Fisher-Price included a removable toy bar. As your child gets older, you can remove this toy bar and convert the seat into a toddler rocker. The actual conversion is very easy and only requires a few steps. Washable Seat Cover: The seat cover is removable and machine washable. It is also dryer safe, so you don’t have to wait a day for it to dry on the line. 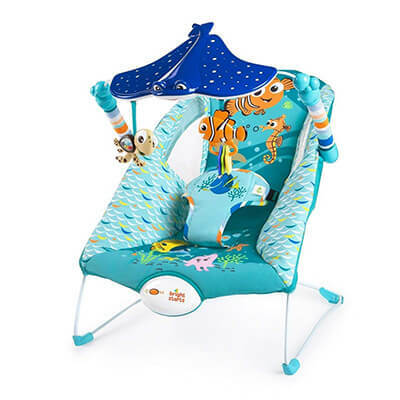 Finding Nemo is a favorite kid cartoon, and this adorable baby bouncer will excite your child. The gender-neutral design means you can use it for multiple kids. It is suggested for ages 0 to 6 months old and offers everything your baby could want and need. So, let’s take a look at how this Disney Baby bouncer lines up with the other choices. Motion: To help calm your baby, Disney Baby added soothing vibrations. Disney added 8 melodies and vibrations to keep your baby relaxed as you get some chores done around the house. Safety and Durability: Disney added mesh sides for increased breathability and visibility. A 3-point harness keeps your baby safe and secure while playing. It’s also a quite deep seat when compared to other bouncers, so your baby shouldn’t be able to fall out. Powered: It is powered by batteries, but you only need 1 C battery. There is no option for AC outlet power, which many parents feel is negative. Extras for Baby: Babies love the large, baby-safe mirror positioned under Mr. Ray that allows for self-discovery and observation. The Nemo and Squirt interactive toys are enjoyable for all babies, but they are also removable if your baby wants to take them on the go! Washable Seat Cover: When life gets a little messy, which is all the time for a baby, just toss the cover in the washing machine! This baby bouncer is safe for babies between 0 and 40 lbs, so you can get a lot of use out of it! A baby bouncer is really just a seat for your baby. The “bouncer” part of the name comes from the ability of your child to make the seat bounce by kicking and moving. Some companies added additional movements to the seats, such as vibrations, along with toys and melodies. Baby bouncers are meant to help parents out and give them a safe place to keep your baby when not in arms. These seats sit low to the ground. It consists of a metal frame covered by a soft piece of padded fabric. You place your baby on that piece of fabric. Remember that a baby bouncer isn’t the same thing as a baby swing, baby cradle, or a baby rocker. These are different baby gear items. They might share similar features, but they aren’t the same thing. Most baby bouncers are meant for the first few months of life. As long as it has a deep recline, you can start using it as soon as you bring your baby home! Once your child starts to roll over and sit up on his own, it’s time to put it away because your child could tip it over or fall out, causing a potential injury. With all of these cozy features in many of the baby bouncers on the market, parents naturally assume it is so their baby can sleep in it. However, most bouncers put your baby in a more upright position than what is safe for a baby. It can be dangerous for a child to sleep in a bouncer, especially if it is unsupervised. Most doctors recommended that, if you notice your child has fallen asleep, you gently move them to their crib or bassinet right away. The reason that babies should not sleep in a bouncer is due to positional asphyxiation. If your child’s chin touches their chest, they are at risk for suffocation. You may not realize your child is struggling to breathe properly until your child is turning blue. Due to this, doctors recommended no sleeping in any location other than a crib, bassinet, or other approved sleeping environments. The next questions parents typically have when it comes to baby bouncers is how long can they safely keep their child in a bouncer. There is no one size fits all answer for this question because it depends on the type of baby bouncers you have. For reclining models, you can safely leave your baby in there for an hour or two, so long as your baby is happy! The longest your baby should stay in an upright bouncer is 20 minutes at a time. Of course, you CAN leave your baby in there longer, but that doesn’t mean it is safe to do so! Parents need to pay close attention to their child’s activity level to determine when it is time to take them out. Yes! Chances are your baby will love to spend time in his bouncer seat outside. Remember that it must be on a flat surface away from any potential hazards. Don’t place it near stairs, a swimming pool, loose pets, or anything else that could cause injuries. This advice also goes for indoors as well. Some baby bouncers come with a sunshade, or you could purchase an additional one if you want to ensure no sun touches your baby. Bouncers aren’t too complicated. There really are only two types – an activity bouncer and a basic bouncer. Let’s take a look at both kinds. A basic bouncer doesn’t offer all the bells and whistles you might see in other selections. It has one purpose – to allow your baby to bounce with his own movements. If you worry that your baby might become overstimulated, this type is the way to go. Unlike activity bouncers, basic bouncers have more bounce than the ones packed with features. Your baby bounces with minimal effort. They are portable and often fold up easily. An activity bouncer comes with the bells and whistles, such as vibrations, music, melodies, and toys to enjoy. They tend not to be as bouncy because of the extra weight of the features, but your child can still bounce in it. We had a certain set of criteria that we used to pick the 5 best baby bouncers. Aside from wanting to provide a variety of choices, here are what we looked at when picking options. Washable Seat Covers: Any parent will tell you that babies are messy creatures. They spit up, vomit, and have diaper explosions every chance that they get! You want the seat cover to come off of the bouncer so that you can stick it in the washing machine for a good cleaning. Spot cleaning anything baby related is time-consuming and never fun. Motion or Vibration: Reclining baby bouncers often offer motion or vibration. Babies love to have a vibrating seat. It helps lull them to sleep. Some don’t offer any type of motion. Instead, your baby is supposed to kick his legs to get the seat to bounce, hence the name baby bouncer. While that’s nice and fun, vibrations can help soothe a tired, colicky baby when your arms are exhausted. Extra Fun Features for Baby: Babies want to have fun too! Reclining bouncers often include a dangling toy bar or a mobile or your child to enjoy. An upright bouncer should have several toys for your child to use and play with while in the seat. Some of those toys may offer sounds and music! Durability and Safety: Any baby gear item you pick up for your baby must be durable and safe – that is essential! For reclining bouncers, a wide frame ensures that the bouncer won’t tip over easily. Super-lightweight or seats that sit up too high have a higher potential for tipping over. Durability is always a factor as well. The company should have used durable, solid materials that won’t break after a few usages. It should have a seat belt for your baby, either a three-point or a five-point harness. Gripping feet prevent the bouncer from sliding all over the place, especially if you have wood or laminate flooring. Price: We promise that you don’t need to spend an entire week’s paycheck on a baby bouncer. The low-end models work just as well as the pricey ones. Do expect to pay for the extras or motorized versions. More features equal more money. Set a budget and stick to it. Your baby will love his baby bouncer no matter what it cost. Battery or Outlet Powered: Anything that has motions, lights, or music will require batteries or an outlet. Take a look at what the bouncer offers. Some do both, and others are just one or other. Batteries are nice for portability, but then you have to buy several sets of batteries. Investing in batteries for months is a waste of money, so having a power cord is a great alternative. You need a place to put your baby down. As your baby gets older, he will want a place to be entertained as well. A baby bouncer seat fulfills both needs, so long as you get one with toys. Think about your particular desires for this purchase. Do you just want a bouncer that your baby can move on his own or do you want something that vibrates? Do you want toys? It’s up to you, as the parent, and any of these 5 choices will provide you with a great pick! We want to know what your favorite baby bouncer is! Make sure to leave us a comment letting us know. Your opinions help other parents out!